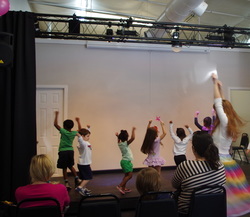 Jitterbug Performing Arts wants to help make the arts more accessible to home-schooled children in Smyrna! We provide a fun, creative, nurturing environment to experience the joys of music, dance and self-expression. Classes are specifically designed to help develop motor skills, fuel the imagination, and sharpen both cognitive and creative skills. Our fun, and energetic classes include unlimited creative outlets for children. This unique, play based program encourages shy children to come out of their shells and leads outgoing children to the next level of self-expression. We offer customized classes focusing on performing arts, singing, dancing, acting, film, puppetry, music, piano & art, or a combination of specialized topics. Join us for a onetime workshop or a monthly, weekly or bi-weekly class! We can even incorporate your curriculum into the lessons! We are working on putting together a couple classes a week, or if you already have 4 friends then you are ready to go! Fill out the form below or email us to find out more about our homeschool program! Want to meet some other local home-schooled children? Join our weekly class! Add performing arts to your curriculum or group!